Jade Wah’oo will provide a series of Shamanic methodologies that anyone can apply in their own life and spiritual practice. 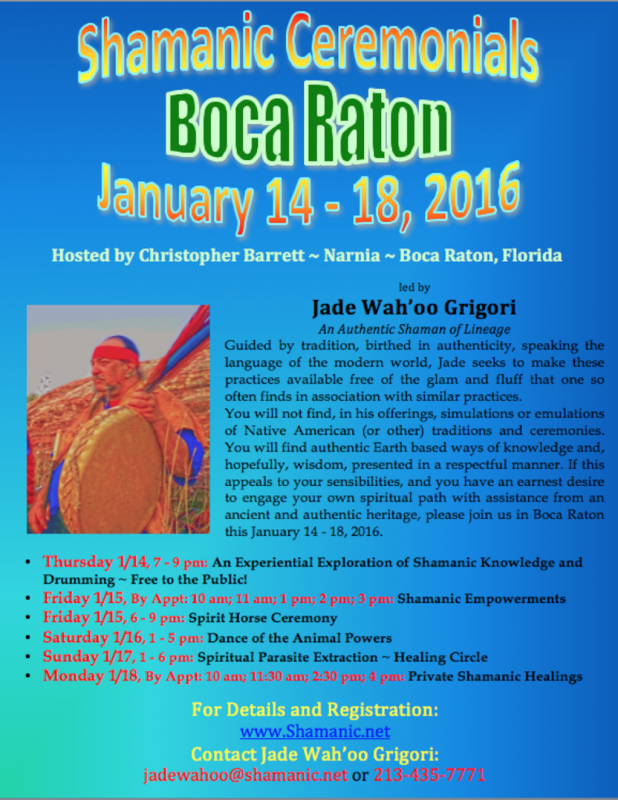 Jade will offer a Shamanic Drumming Journey for everyone’s personal experience. Open forum Q&A and discussion will serve to reveal the significance and principles in each shared Knowledge. Celestial Soul Activation: In order for effective healing, manifestation and empowerment to occur the Celestial Soul must first be activated by engaging the Celestial Soul, bringing it into conscious embodied experience. Drumming Journey – Empowerment of Heart’s Desire: By means of the Shamanic Drum we journey into the Dream Realm to encounter the obstacles or impediments we hold that have prevented us from manifesting our Heart’s Desire. Next we enter the Celestial Realm to harness the power of the potentiality of all possibilities to provide us with the Empowerments needed to bring it all home into worldly manifest expression. Syzygy: These two Activations work synergistically to enable the Journeyer to experience life in an aligned manner greater than either ceremony done independently or in tandem is able to provide. Shamanic Drumming Journey! By way of Drum we journey in Spirit through the realms of Soul. Seeking our Spirit’s true desire, into the Underworld we go to meet and transform the obstacles and impediments which prevent the free expression of our Spirit’s desire. Then into the Celestial realms we move by means of ecstatic Shamanic flying, there to re-create our lives in accordance with Spirit’s intent. This ceremony is highly experiential, an opportunity to fly as Shamans fly! Powerful, Beautiful and Life Changing. Dance! Sing! Empower! In this Ceremony we will enter into Shamanic Trance, journeying to the Circle of Animal Brothers, there to Dance and Sing their Knowledge into our bodies, carrying the gift received into the World on behalf of all Peoples… our families, our communities and our world. With ecstatic abandon we entice and receive these Forces of Creation into our lives. We will dance and sing the Animal Spirit into conscious embodied presence, where it will share with us its Knowledge and Power! Sunday 1/17, 1 – 6 pm: Limited to 7 participants! During the perpetration of abuse there is an entity, a Spiritual Parasite, that is transferred from the perpetrator to the victim. The infestation of this parasite causes specific biological responses ranging from a tendency to perpetrate abuse upon others to self-destructive behaviors, depression, anxiety/panic attacks, self-sabotage, substance abuse, immune and health disorders or suicidal thoughts. After a deep orientation and exploration of the intricacies of the Spiritual Parasite infestation and its affects upon our life, each person present will receive one-on-one treatment: the removal of the parasite through an ancient Shamanic practice of ‘extraction’. The consequence of this treatment is forthright: Freedom! Re-establishing Spiritual Balance lessens the gap between the individual’s current life movement and their Spirit’s Path. It is in this gap that discord, disease and dysfunction resides. In this 1.5 hour session Jade Wah’oo will speak with the Spirits on the client’s behalf and, after a thorough assessment and understanding is achieved, the particular ceremony best suited to assist re-integration is worked on behalf of the client. To hold your appointment, pay with PayPal now.